Black Jake & the Carnies - Black Masala - Magpie String Band @ Velvet Lounge, Washington DC - Jun 3 2013. 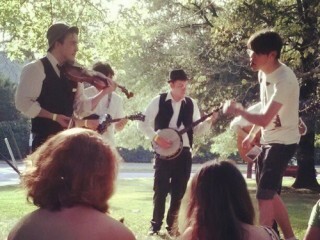 This acoustic quartet consists of washboard, mandolin, banjo, and guitar with mutliple vocals, although one guy takes the lead. This sounds like a field recording and with good reason as the singer tells us that they have rehearsed for about two hours. Tight beginnings and endings, as well as tightness in general, were nowhere near this set of music. Yet, I had no problem whatsoever with that as this sounded like a really good field recording. Even the vocals had that worn-out 78rpm feeling in them. There were plenty of classic covers like "Will the Circle be Unbroken" and "Blue Moon of Kentucky" that fit in with the originals. The vibe was good and the audience of about 25 or so enjoyed the effort here, which is pretty normal for the Velvet Lounge. Good start to what will no doubt be an interesting evening. This octet has only been around for a bit more than a year, and they quickly show that they have had just a tad more than two hours practice. The two trombones, sax, and accordion take the lead instrumental thrust with the bass, drums, and guitar holding down the rhythms. This is instrumental fury that reminds me of some sort of klezmer and gypsy music hybrid with eastern moves along with various twists and turns exploding all over. There are vocals that are quite inviting from the female lead as well as the drummer and bassist. I lean toward hearing more of the Klezmatics than Gogol Bordello as the punk gypsy sound is less than the jazzy world rock moves. But, boy can this band bring the pace as this is about a 180 degree shift from the opening set. I particularly liked the cut where the guitarist brought out a searing eastern riff that reminded of Boiled in Lead combining a Thomas Mapfumo tune with a jazz number. Great music here, and nearly impossible for the now 50-strong audience to relax, as this music goes out and grabs you. Touring their EP which I thoroughly enjoyed, this Ypsilanti, Michigan collective perfectly dissects the two somewhat polarized opening sets. They fully embrace the form and genre of the opening band, yet they have the crazed performing style of the second band. This kind of variety where the headline band pulls it together makes for a great formula when the quality is there. Immediately the quality shines with these guys, as they have loads of energy to add to their crisp execution of stomping Appalachian styled tunes. 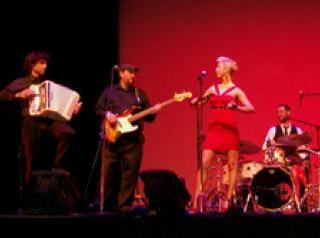 The drummer plays kick, snare, and washboard and the crazed bassist plays an acoustic (with pickups), while the lead instruments are accordion, mandolin, violin, and a banjo that has its own light show. Some of the violin moves are devilishly crazy, while the rhythms keep everything churning. They even have a carnival game where audience members attempt to throw balls through Baba Yaga's mouth. Unlike many real world carnival games, some people actually win. With fun covers of INXS and the Misfits "Horror Business" (I am still disturbed for some stupid reason when I see bands cover the Misfits who likely weren't even born when the song came out), they took their sound and expanded it well beyond expected confines. This was a blast and they took the crowd late into the night with their great music and lively personalities. I always hope that bands like this get the success and recognition they deserve. 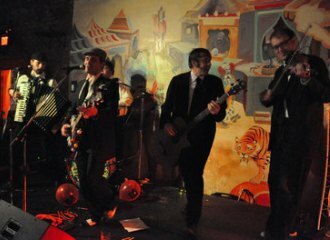 Photo Credits: (1) Magpie String Band, (2) Black Masala, (3) Black Jake and the Carnies (unknown / from websites).